Save Your Back–A Pot Rack! 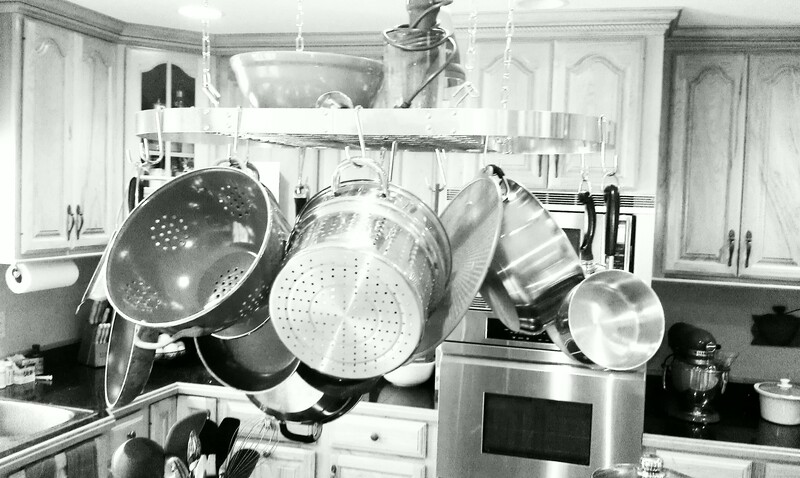 MY POT RACK: When you are on the GAPS diet/SCD diet or any whole foods diet and you homeschool, you live in your kitchen! My awesome father- in-law picked this out for me and installed it during his last visit. I think my in-laws got tired of bending over and putting things away in the bottom cupboards when they visited! I know I sure was sick of bending over. I love my pot rack. Anything I can put up there, I do! I purchased it from Amazon.com. It is a Range Kleen Oval Pot Rack in stainless steel. He said it was easy to install. Love it! I did not center it over the stove because I did not want it to get splattered on from whatever was cooking below. Addendum: I have had this up now for about 6 months. I am still very pleased with it. I haven’t measured the amount of weight I hang up there, but I know it’s pushing the limit stated. At least. Positioned as it is, I haven’t had a problem with the appliance and pots/pans getting spattered with oil from the stove below. Really, I still couldn’t be happier with this little kitchen addition. This entry was posted in For the Home and tagged fun and easy kitchen updates, pot rack recommendations, pot rack review, Range Kleen Oval Pot Rack review on January 26, 2013 by thehomeschoolingdoctor.